Seminar Topic: October 2017 Lincoln Wheat Cents with a Grading Seminar afterwards. Lincoln Wheat Cents with a Grading Seminar afterwards. types of coins with you to view and discuss! Labels: Seminar Topic: October 2017 Lincoln Wheat Cents with a Grading Seminar afterwards. Minnesota State Quarter Errors (Extra Tree Varieties). order to find your own errors. All Club Members and Friends: So Long Neil! You will always be in our thoughts! It is with great sadness that I must inform all of you that our close friend, Neil Hedin, has passed away. The link to his obituary through Rowe Funeral Home is listed below. Neil touched my life in so many ways and words cannot express how much I will miss him. I’m sure many of you receiving this email are going to miss his friendship as well. He was truly one of the “Good Guys” that you so seldom meet in one’s lifetime! So Long Neil! You will always be in our thoughts! Labels: So Long Neil! You will always be in our thoughts! Seminar Topic: June 19th will be our annual Summer Picnic. June 19th will be our annual Summer Picnic in lieu of a regular meeting and will be held at our regular meeting site at the Grand Rapids YMCA. The Club will purchase Burgers, Hot Dogs, Buns and Condiments and everyone else brings(Optional) whatever they want to share like cookies, chips or other goodies. Please bring your own non-alcoholic beverages. The party starts at 6:30 instead of the normal 7:00 time. We will have bid boards (silent auctions) on various coin/currency/hobby items being sold by club members. Be sure to bring some money along if you might want to bid on some of the items. Please email me or call me (244-9299) if you intend to bring any items to sell on the bid boards. If you are bringing any items to sell on the bid boards, please try to be there by 6:00 or earlier. This is mainly just a social get-together. Guests are always welcome. In order to get a more accurate account of how much food to order, I would appreciate reply confirmations, if possible, from any of you planning to attend and how many guests you might be bringing as well. PS: Don’t forget to bring money along in case you plan to purchase anything on the bid boards! Labels: Seminar Topic: June 19th will be our annual Summer Picnic. Our seminar topic will be Seated Liberty Coins. Please bring any examples of these types of coins with you to view and discuss! Labels: Seminar Topic: May 2017 Seated Liberty Coins. Seminar Topic: April 2017 discussion of Gold items such as Coins, Nuggets, Flakes, Jewelry, Fools Gold, or any other forms of Gold. Fools Gold, or any other forms of Gold. Please bring any examples of these types of coins or items with you to view and discuss! Labels: April 2017 discussion of Gold items such as Coins, Flakes, Fools Gold, Jewelry, Nuggets, or any other forms of Gold. We still need more volunteers to work at the Club table for our Coin Show on April 1st. The time slots are 9:30 to 11:00, 11:00 to 12:00, 12:00 to 1:00, 2:00 to 3:00 and 3:00 to 4:00. Even though 1 person is already signed up for the 9:30 to 11:00 shift, it never hurts to have extras, especially in the first few hours when the crowd is the busiest. Contact me if you can help out. Attached is a copy of the Coin Show flyer so you have all the info. Please feel free to forward it on to anyone you know! 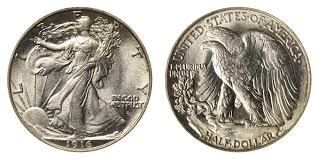 The Northern Lakes Coin and Currency Club wishes to invite club members and new guests interested in the hobby to attend the monthly meeting on Monday, March 20th, 6:30 PM (Note the earlier time) at the YMCA Building at 400 River Road. 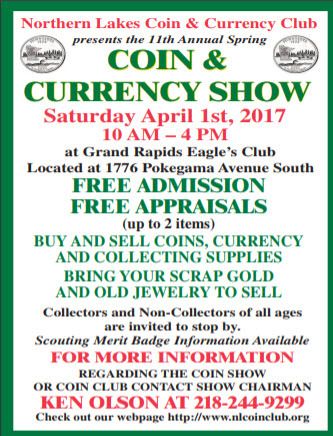 In lieu of a meeting and for the benefit of you, the members (and guests), there will be a mini coin & currency show with items for sale so that you can get a preview and first chance to purchase items that will be for sale at our regular Coin Show on April 1st. Non-members are welcome to attend. Please tell other people you know about this so we can have a bigger crowd. For more info, contact Ken Olson244-9299. If you plan to bring anything to sell, please call me 244-9299 or send me an email reply so I know how much space you need. Please be to the YMCA before 6:00 if you intend to sell items so we can arrange locations. there to help all the time. Seminar Topic: February 2017 Error Coins, Variety Coins, Die Break Coins, etc. Monday, Feb. 20th, 7:00 PM in the YMCA at 400 River Road. Our seminar topic will be Error Coins, Variety Coins, Die Break Coins, etc. these types of coins with you to view and discuss! We never came up with a seminar topic for tomorrow night, so we will do a Show and Tell session. We will also be having our Club election of officers. I would like you to bring ideas for Seminar topics for our future meetings as well. Start thinking of new topics tonight as to what you would like to learn more about! December 19th will be our annual End of the Year Picnic in lieu of a regular meeting and will be held at our regular meeting site at the Grand Rapids YMCA. The Club will purchase pizzas and everyone else brings(Optional) whatever they want to share like cookies, chips or other goodies.Please bring your own non-alcoholic beverages. The party starts at 6:30 instead of the normal 7:00 time. We will have bid boards (silent auctions) on various coin/currency/hobby items being sold by club members. Please email me or call me (244-9299) if you intend to bring any items to sell on the bid boards. If you are bringing any items to sell on the bid boards, please try to be there by 6:00 or earlier. This is mainly just a social get-together. Guests are always welcome. In order to get a more accurate account of how many pizzas to order, I would appreciate reply confirmations, if possible, from any of you planning to attend and how many guests you might be bringing as well. YMCA Building at 400 River Road. sale at our regular Coin Show on Sept. 24th.